Easy but elegant dinner for two . . . I tried two new recipes this week, both from the August & September 2011 Taste of Home magazine. My collected recipes fall into one of two categories: those that please adult palates – meaning I will make them for myself and husband when the children aren’t around, and those that are universally appealing – meaning children are also apt to enjoy them. 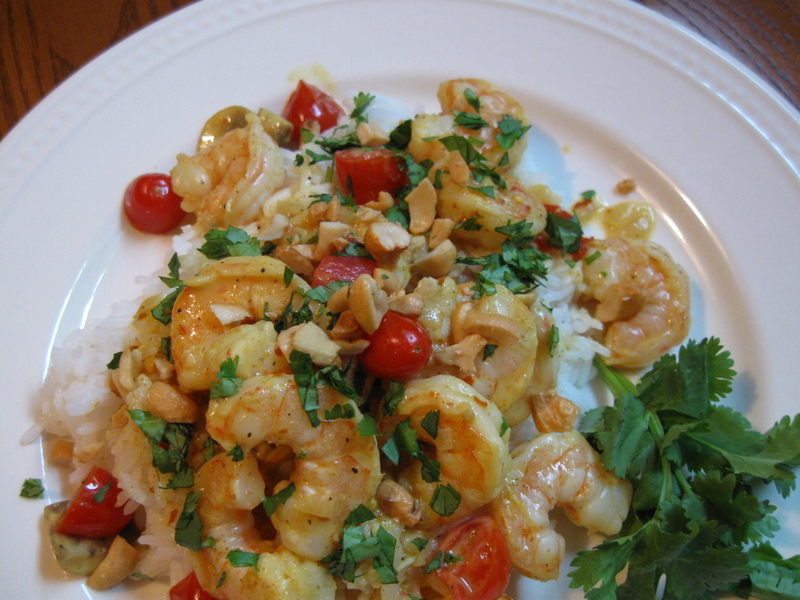 When I saw the recipe for Thai Shrimp, I recognized it as a perfect dinner for two. So I added it to the week’s menu, since my husband and I would be dining sans children Sunday night. A recipe for Tailgate Sandwiches also caught my eye, mainly because it seemed so kid-friendly – simple and flavorful (school’s back in, fall sports activities are in full swing – I need quick but tasty weeknight options). Sunday night’s Thai Shrimp was spicy, flavorful, satisfying. (It also exuded a wonderful aroma courtesy of garlic, ginger and curry.) Served over jasmine rice, it was a lovely “grownup” dinner. I, for one, could not gobble them up quickly enough! My husband also gave them a thumbs up. Who wouldn't love these cute ham sandwiches? The children, however, were not impressed. All four rated them “so-so” (their description). 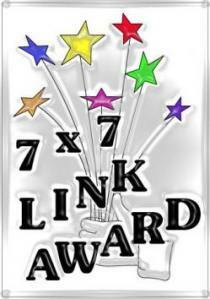 Three had them fresh that night; the seven-year-old had them as leftovers and was equally dismissive. I was flabbergasted, since I found them SO DELICIOUSLY ADDICTIVE! What was wrong with these children?? My husband surmises the sandwiches are just too rich for kids. Ah, well. Whatever the reason, I suppose they won’t reappear as a family dinner. But, my husband and I can now move them into the grownup category – and have the entire lot to ourselves when we make them! Sprinkle shrimp with 1 tablespoon lime juice, then with salt and pepper. Saute shallot, ginger and garlic in oil for 1 minute in large skillet. Add shrimp; stir and cook for 2-3 minutes or until shrimp turn pink. Remove with a slotted spoon and set aside. Add tomatoes, mushrooms, broth, coconut milk, curry powder, pepper flakes and remaining lime juice to skillet. Bring to a boil. Reduce heat and simmer uncovered for 8-10 minutes or until mushrooms are tender and sauce is slightly reduced, stirring occasionally. Add shrimp and heat through. Garnish with cashews and cilantro. Arrange bottoms of rolls in greased 13 x 9 pan. Layer with ham and Gruyere cheese. 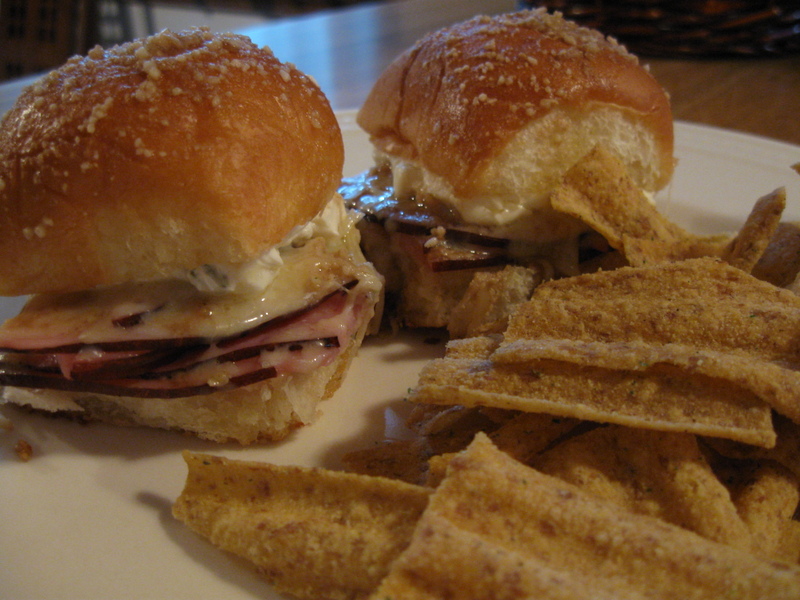 Generously spread cut side of roll top with cream cheese and place over Gruyere. Combine butter, Parmesan cheese, Worcestershire sauce and onion in small bowl. Drizzle evenly over sandwiches. Let stand for at least 20 minutes. Cover with foil and bake at 350 degrees F. for 20 minutes or until heated through. ← Baked Spicy Shrimp. How do I love thee? Let me count the ways. Yum, I think I want two dinners now. Both of these recipes would be winners in my house. I thought they would be at mine, too. The children obviously don’t know what they’re talking about . . .
Two tasty adult meals. When the kids get older, they will gobble up those sandwiches. In the meantime they are yours, all yours. Scrumptious. That’s a good word. Definitely how I felt about them. Ah! It’s those cheeses – too grown up, all the gruyere, parmesean, onion and chive. I think kids unanimously like cheddar, mozzarella and squeezy Velveeta. Remake these little beauties with those and you have an easy Sunday night dinner with soups. Well, at least that was my Mother’s SUnday night menu – grilled cheese and Cambells tomato soup. We loved it. I think you may be right about the cheese varieties . . . but I would agree that grilled cheese and tomato soup always hits the spot!